I began my day with a 3.45 pm screening of Ecuadorian Ana Cristina Barragan's award-winning feature debut, Alba. 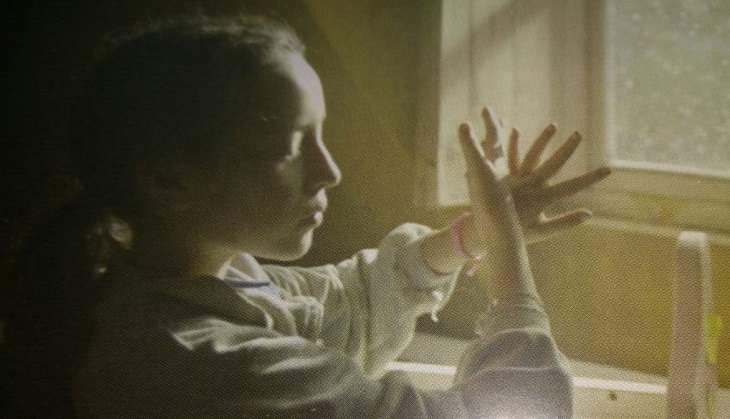 The film explores an extremely reticent and withdrawn 11-year-old girl's attempts at figuring out how to deal with her challenging world after she comes to live with her estranged father, Igor (Pablo Aquirre) when her beloved mother is hospitalised. The insightful film is replete with symbolisms (the girl is working on a giant jigsaw puzzle even as she tries to work out her relationship with her father, a ladybird is gnawed by ants, a butterfly is crushed in a palm) but fortunately, never resorts to melodrama. It explores the girl's loneliness and her social isolation as expressed in her multiple inabilities to fit into an elite school milieu (she gets down at an affluent address instead of her own house and even rings the doorbell and embraces the man who opens the door to pull the wool over her friend's mother and her friends' watchful eyes.) A conversation during a car ride in which the father seems to weigh each word before uttering them, makes you ponder on the possibility of shyness being a genetic predisposition. Alba finally finds a semblance of acceptance from her peers when she performs a dance at a party thrown by a school friend, but immediately thereafter she has to make a life-altering choice ... she learns that some emotions take precedence over the desire to fit in. Her choice holds promise that if two shy people find each other, they can make a functional family. Macarena Arias who plays the titular role of Alba speaks volumes with her doleful eyes. It is by far the best performance I have seen in the festival so far. Based on the real-life shootings at the University of Texas at Austin, USA, in 1966, Tower is a documentary with all the ingredients of a reel thriller. A disturbed sniper, after killing his wife and mother, holes up on the top floor of a tower, and mindlessly kills whoever comes in his sight on the campus. Among the dozens of unsuspecting victims is a pregnant woman who has been felled by a bullet and is bleeding to death. She inspires a rare act of courage - a stranger risks being shot down, runs towards her and lies down next to her to help her pull through the ordeal by offering moral support. Tower is an interesting blend of rotoscopic animation and real-life archival footage. It is reportedly based on interviews with more than 100 people (students, TV reporters, police officers) who had witnessed the event. The film makes a case for the anti-gun policy both implicitly and explicitly. A line from the film echoed in my head while I waited in the lounge outside Screen 5. The pregnant woman (who survived the encounter with death but lost her boyfriend) when asked if she has forgiven the sniper admitted she had because "I have been forgiven so much too." The film explores the spectrum of human responses in times of crisis ... and afterwards. I wondered why the pregnant woman's mysterious lady rescuer never kept in touch with her again barring a single meeting in which she gifted a painting. Fact, at times, is truly stranger than fiction. The third film of the evening, Ming Of Harlem, made me wonder if I had walked into the wrong theatre. The theatre had plush reclining seats but surprising few people. This ponder-worthy docudrama is based on a bizarre real-life incident involving an American man, Antoine Yates, who was arrested for keeping a giant Bengal tiger named Ming and an alligator named Al in his twenty-first floor apartment in Harlem, New York City! The film first shows you Antoine being driven around the streets of Harlem, and this establishes the incongruity of this highly urban setting with the animals who star in the film. Next, the film goes without dialogue for a long chunk as it shows you the tiger pacing up and down a large but largely-bereft-of-furniture apartment. The alligator got limited attention - but his bulbous eyes evoked a cold chill in me as he gracefully glided inside his confined environs. Apparently, the flat has been reconstructed to replicate the original. Ming and Al would have continued to live the rest of his life in captivity if Ming hadn't bitten Antoine's leg compelling him to call the emergency services. I have often used the phrase 'Pacing like a caged tiger.' This film made it real for me. My lady friend, who was watching this documentary with me, was as restless as the ceaselessly pacing tiger and expressed her anger at the film not elaborating on how Antoine took the animals to his apartment and how he slept at night with a tiger in the next room. I found it odd that Antoine, who spoke of love, sought the company of predatory animals rather than human beings for company. Who was lonelier - Antoine or the animals? After the film, my friend fled the theatre like a captive tigress released in the jungle. I went on to gorge on Khow Suey at the Food court, while ruminating on the tiger in the flat, and wondering why we humans preferred being hemmed into closed, confined spaces like malls when we have that wonderful gift denied to so many ... Choice.